I have the best job. I get to share Jesus’s love with the nations without ever leaving Nashville. 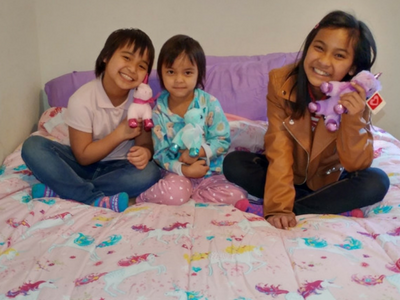 I get to deliver things like a donated bed complete with purple sheets and unicorn bedding to a set of sisters that have never had anything but a pile of blankets on which to sleep. Generously sharing from our abundance is the visible part of our ministry, but it does not show the whole picture. As I walk alongside refugees that are adjusting to life in America, I am gaining friends that feel like family. The more time I spend with them, the more aware I am of the terrible losses with which they have to live. We cannot restore destroyed homelands, and we can never replace lost loved ones. Often, these losses lead to bondages of addiction that so many of these people experience. In some ways, we are powerless to help them, but because of Christ’s love for the broken-hearted, we can introduce them to a Savior that is more than able to alleviate spiritual poverty. Your prayers, on behalf of the least of these, are a sweet fragrance before the throne of God. We are aware of several children from other families still sleeping on the floor; please contact us if you would like to donate a bed.